for Super Hero Time 2004. It is a joint collaboration between Ishimori Productions and Toei. Along with the standard insect motif of the Kamen Rider series, Kamen Rider Blade also uses a playing card motif. Each Rider is assigned one of the suits from a deck of cards. The series catchphrases are “Now your power is at its peak.” (今、その力が展開する Ima, sono chikara ga tenkai suru) and “Take the trump card of fate!” (運命の切札をつかみ取れ! Unmei no kirifuda o tsukamitore!). Ten thousand years ago, a massive battle known as the Battle Royal was fought by fifty-two demons known as the Undead, each representing a species fighting for dominance over all others. The winner was the Human Undead, known as Category Two of Hearts, giving dominion of the Earth to humanity. In the present day, archaeologists discover the sealed Undead, and accidentally set them free. Thus, a new Battle Royal begins. Having developed the Rider System, based on the Joker’s ability to copy sealed Undead, the organization BOARD (Board Of Archaeological Research Department) equips two young men, who become Kamen Riders: Kazuma Kenzaki and Sakuya Tachibana fight together as Kamen Rider Blade and Kamen Rider Garren to protect humans from Undead and seal them. 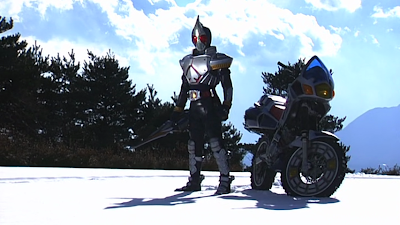 Also fighting Undead is the mysterious Chalice, a Kamen Rider whose purpose is unknown. In addition, a young man struggles to free himself from the control of the sealed Undead powering his own Undead-made Rider System, fighting as Kamen Rider Leangle. Di kumpulbagi kok gak bisa di donlot ya???? Di kumpul lagi ga bisa download & streaming..